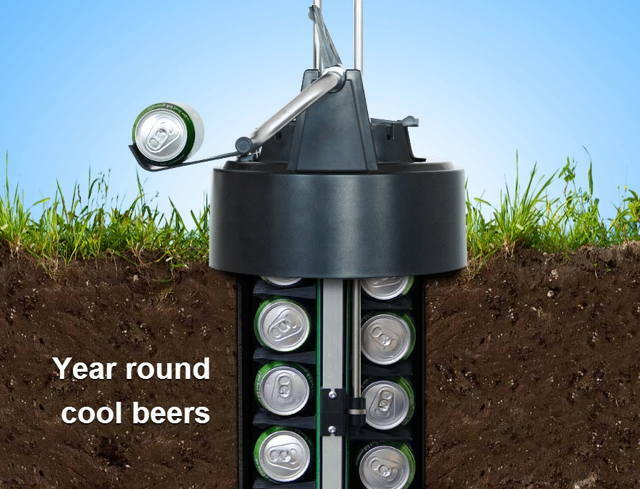 eCool Beer Cooler Uses The Earth To Keep Your Suds Frosty | OhGizmo! Deal Of The Day: Another Giveaway, This Time It’s A Samsung HDTV! By David Ponce on 05/28/14 • Leave a comment! Warm beer is as appetizing as cold soup (sorry, gazpacho lovers), but keeping the temperature down on your malt liquor does usually use up some electricity. If this thought rubs you the wrong way, take a look at the eCool Beer Cooler: it uses the coolness of the earth to keep the temperature down. Dig a deep hole, place the eCool in there, and you’ll have access to 24 beers that will be as cold as your ground is. Granted, if you live in a really warm climate, this may not be that cold. But in campgrounds and other places far removed from the grid, the eCool seems like a fantastic, if not ideal, solution. Also, the beers will allegedly not freeze in the winter, which could make this work year round. You’re going to have to be a “real man” with a deep wallet as well if you want to own the eCool, as the asking price is around $285. ← Deal Of The Day: Another Giveaway, This Time It’s A Samsung HDTV!